Aberfeldy has its own tartan for the first time, thanks to the ladies of Aberfeldy & District Gaelic Choir and Strathmore Woollens of Forfar. The colours of a new tartan must reflect the area and the traditions it represents – and the colours chosen for the Aberfeldy tartan evoke the watery Tay, the heather and the hills, and the strong association with the Black Watch. All the colours are tied together with a delicate white stripe, representing the prehistoric ley lines which course the Aberfeldy surroundings and are said by many to be the reason for the area attracting a wealth of creativity and energy. 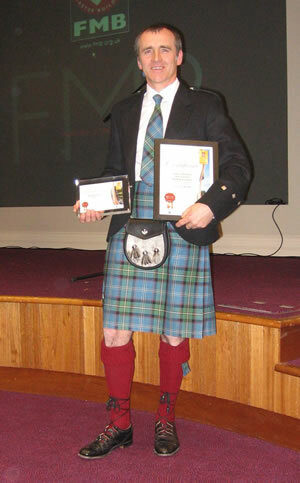 The first kilt to be woven in the new Aberfeldy tartan was worn by Choir member Janusz Jolkowicz when he received his building awards at ceremonies in St Andrews and London last year. It is hoped the tartan will be launched officially later in the year, but orders for men's kilts are already being taken - at the special price of £250. Anyone interested in ordering a man’s kilt in the new Aberfeldy tartan should email Susan MacDonald, or call her on 01887 820478.